The LG G3 was one of the most acclaimed smartphones of 2014, mainly because when it was launched, it came with the best QHD screen one could find on the smartphone market and because its design was pretty attractive. The OnePlus One, on the other hand, became popular as the flagship killer and the main attraction of the device is the low price-point at which the company is selling it. The drawback of the OnePlus One is that you can only get it by invite, even though a short few hour pre-order period was available at the end of October. According to the company, OnePlus, the flagship killer has already sold 500.000 units worldwide and they aim to hit the 1 million mark by the end of the year. At the same time, the company announced that it would be organizing pre-order periods for the device soon. The LG G3 is readily available, although its price is heftier than that of the OnePlus One. Nonetheless, it is one of the most revered smartphones on the market and it should be among the first ones, besides the Nexus and Google Play Edition devices to receive the new Android 5.0 Lollipop update. If you are in a rut but would like to buy a smarpthone that is both fashionable and reasonably future-proof, the LG G3 and OnePlus One are two of your most viable options. 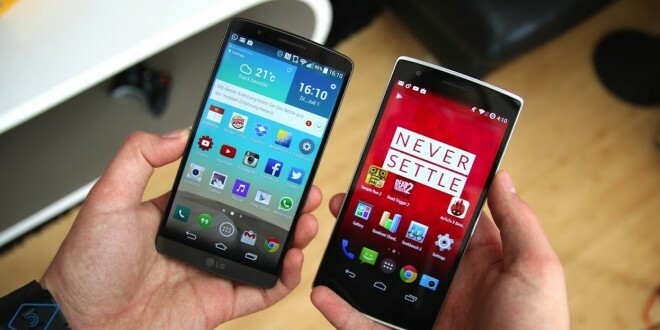 While there is a considerable difference between the LG G3 price and OnePlus One price, this comparison between the two powerhouses should help you decide which offers more bang for buck. First off, let’s start with the negative parts. One of the big cons of the OnePlus One is the lack of support. While the flagship killer runs on CyanogenMod 11s, and it’s pretty ok with the software side of things, customer support has been severely criticized the past year. OnePlus One owners have been complaining that their requests, reports and complaints are being ignored by the company. At the same time, one of the big downsides of the OnePlus One is that it’s not refundable. That means that in case you get a faulty device that doesn’t work, which is not an uncommon event, there will be nothing you could do. The company doesn’t give refunds and if you try to contact them, either they won’t respond or take a really long time to do so. That being said, while the OnePlus One is an excellent premium flagship, the lack of support is a serious drawback for customers. If you are willing to take the risk, then it shouldn’t be a problem. After all, issues with smartphones can be resolved through other channels as well. With the LG G3 the issue of support needn’t be discussed since we’re talking about an old company with a great history on the smartphone market. LG has been around in the flagship department for as long as Samsung has, so we are fairly sure that the company is a good deal more trustworthy than OnePlus. While we can’t speak of significant flaws with the LG G3, we would have liked a different button placement on the flagship and a better battery life, although we’re not complaining. Another drawback of the OnePlus One is that you have to get your hands on an invitation before being able to buy the phone. While invitations aren’t hard to come by if you do your research, it does take time and it is a hassle, to be honest. Nonetheless, the OnePlus One has been mostly acclaimed for its features and design. Another issue with the flagship killer is that it tends to be buggy, having touchscreen issues and overheating problems, but these should be resolved with the latest firmware update for the flagship released a few weeks ago. It does seem like the OnePlus One has more cons than pros, but let’s see how it compares to the revered LG G3. As you can probably see, the LG G3 specs and OnePlus One specs are pretty similar to one another, with a few extra features like better resolution and pixel density, optical image stabilization, infrared and wireless charging present on the LG G3. The OnePlus One outdoes the LG G3 camera only with its larger 5 MP front shooter. While the LG G3 has a few extra features and the Android 5.0 Lollipop update for the flagship is already looking good, it still is more expensive. While the price difference is not that big, it can still be considered an important aspect of this comparison. When it comes to the previous cons of the OnePlus One, such as support and buggy hardware, we can safely say that if you are willing to risk those things, the OnePlus One is certainly worth the price. It’s considerably cheaper than other flagships you can find on the market and it brings just as much horsepower for the user. Android 5.0 Lollipop for the LG G3 has already leaked online and we can see that the company is diligently working on the OTA, which should be released by the end of the year. While the leaks show that Android 5.0 Lollipop on LG G3 will still be receiving LG’s usual Optimus treatment, it doesn’t look half bad. LG hasn’t set an exact date for when the Android 5.0 Lollipop OTA for the LG G3 would begin its rollout, but we hope that the handset will be upgraded by the time Christmas hits. The OnePlus One should also be getting Android 5.0 Lollipop, but rumors say that won’t happen until Q1 of 2015. In any case, the decision is up to you. If you want a sharp crisp screen, optical image stabilization, laser autofocus and infrared, the LG G3 would suit you better. The OnePlus One is a cheaper flagship with a nice CyanogenMod ROM on top, so it’s certainly worth the money. While support issues don’t happen to everyone, you certainly have to consider the possibility before using up that invite you finally got your hands on. Which would you choose? I like CyanogenMod better, and would rather pay less for roughly the same performance, but I do wonder about support and whether I will end up with a defective flagship killer with which I can’t do anything. That being said, I think I would rather cough up the extra few bucks and get the LG G3 for myself. Previous Tracking lost smartphones is easy, regardless of OS!